Have questions? Take a look at our Camping FAQ and What to Bring/Not to Bring Page or email camping@kaslojazzfest.com! Kaslo Jazz Etc Festival is pleased to offer festival camping directly above Kaslo Bay Park, separate from the main campground. 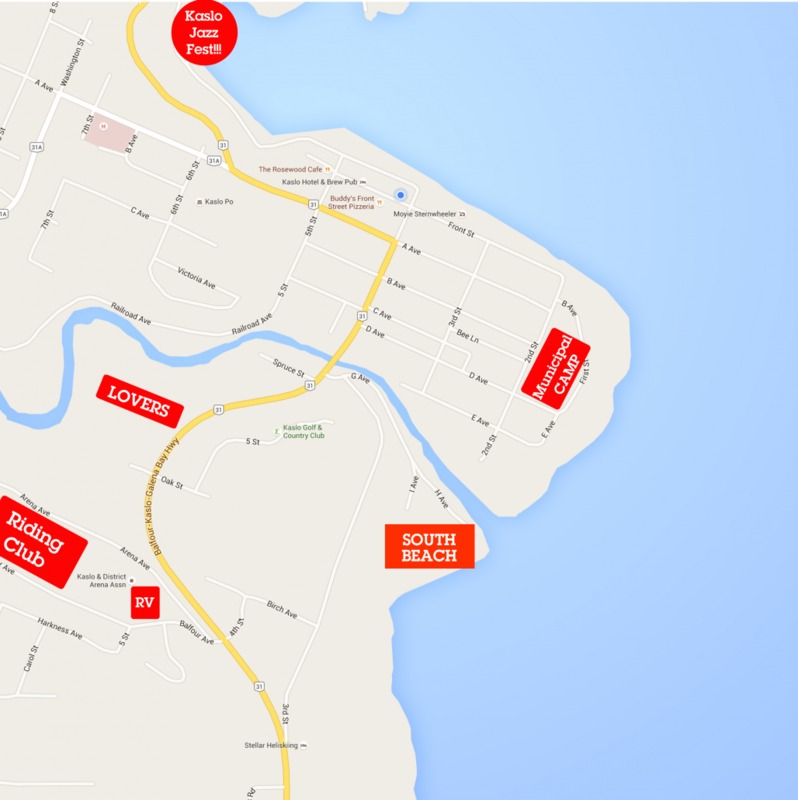 Jazzlo Bay Campground is situated a very short walk from the Main Gate and offers the closest proximity to the venue available. Tents and Camper Vans can stay just up the hill from the Festival starting at 2pm on August 1 until 12pm August 5th, 2019. Gates open at 2pm Thurs Aug 1st 2019 for RVs, Trailers and Tents. All campers must be gone by 12pm Mon August 5th 2019. Handwashing stations, Flush Toilets, and pay per use showers are provided. No dogs, glass, or fires in South Beach campground. Quiet time at 12am is strictly enforced by security! No vehicle in & outs, vehicles must remain in the campground for the duration of their stay (exceptions made for emergencies and special needs). Minors under the age of 18 must be accompanied by an adult. RVs and Tents together with permanent shower facilities! For information and reservations, contact the hostess Trish Bennett at kaslocampground@yahoo.ca and by phone at (250) 353-2662.